Don Horton worked with his family on barges from the age of 10 to 18. This meant that during WWII, his family was part of the merchant marines, doing dangerous work since German U-boats were attacking American commercial vessels trading along our coast. His brother, while a minor, died when a tug was torpedoed by a German U-boat off the Virginia coast. In 2015, PortSide interviewed him as we took him around Red Hook to reminisce about his wartime memories of the place. He accidentally meets Sunny Balzano, and they share memories. Don is a leader in the movement to have the women, children, elderly and disabled merchant mariners of WWII be recognized for their service. 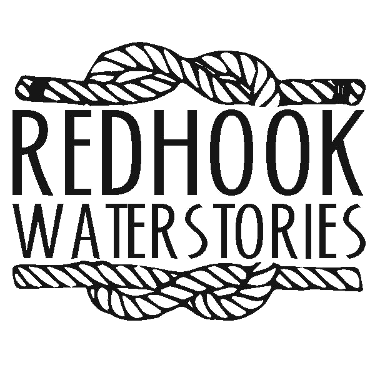 Red Hook once had two graving docks and many floating dry docks. 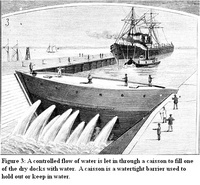 This wonderfully illustrated article from the January 13, 1883 edition of Scientific American explains how graving docks at what became Todd Shipyard work. The shipyard site is now owned by IKEA, where you see the outline of the former graving dock in cobblestones in the parking lot. The dry dock's caisson (the door that you close to keep the water out) is still floating at the end of the dock area. 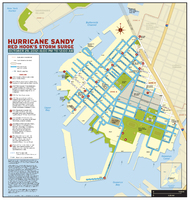 YES, post hurricane Sandy, Red Hook has been, and still is being, intensely studied by the city, state and federal government; and it is being studied by many academic projects as well. Here is a quick overview of multiple government-funded plans and how they interrelate (or don't). Ever wonder what's going on behind the containerport fence? This article explains how the place works. Red Hook gets one of its signature icons – gantry cranes at sunset – from the neighborhood’s largest maritime facility, the Red Hook Container Terminal (RHCT). A walk around Red Hook starting at PortSide New York's MARY A. WHALEN, in Atlantic Basin, meandering to Red Hook's NYCHA houses and then ending up at the restaurants of Van Brunt Street.